I had the opportunity to judge the Sidecar by Merlet cocktail competition alongside Luc Merlet and molecular mixologist Tony Conigliaro during last weekend’s Art of the Cocktail festival. Fifteen bartenders from Calgary and Edmonton came together inside the Bourbon Room at National on 10th to add their own creative twist to a Sidecar and to create an original cocktail using either Excellia tequila or G’Vine gin. Each competitor had a mere six minutes to shake up two different drinks while charming us with the story behind them (sporting old-school beards, bow-ties and vests added to the showmanship, but was not a requirement!). We then had to judge each competitor on their performance and the inspiration behind the drink, as well as the drink itself: appearance, smell and taste, balance, interplay of ingredients, and how well it highlighted the Merlet products (cognac and triple sec for the Sidecars). I was nervous at first being on a panel with two cocktail aficionados who between them could likely create all the cocktail menus in Calgary, but after we compared notes half way through and I saw that we were on the same page when it came to scoring (e.g. we all liked the same drinks best), I became more confident in my palate. 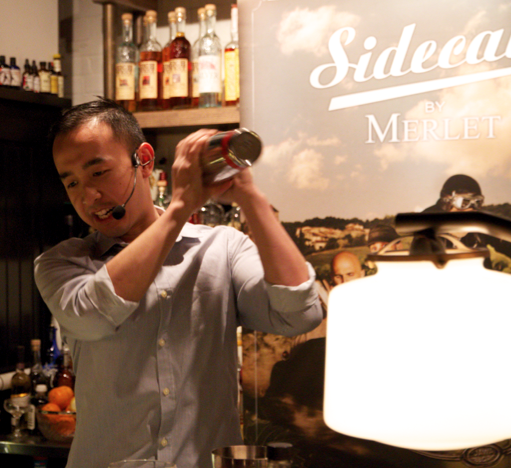 Winner Jimmy Nguyen of Teatro knows his way around a cocktail shaker — and all the ingredients of a Sidecar. Image courtesy Art of the Cocktail. In the end Jimmy Nguyen of Teatro won the competition and the grand prize — a trip to France — by presenting us with a perfectly balanced Sidecar enhanced by a citrus sugar rim on the glass and a lemon juice and grape tea foam set atop the drink. Though I am a fan of the classic Sidecar, I have to say that sampling 15 different ones in a row was palate-puckering. It was a nice break to try the creative gin and tequila cocktails. My favourite was the Stone Cold Jane Austen by Edmonton bartender Evan Watson of Woodwork. It’s like a White Lady meets Corpse Reviver #2 (one of my favourite gin cocktails). The peppercorn-lemongrass simple syrup made this drink, in my opinion, and the peppercorn garnish was a beautiful finishing touch. Do try this at home. The peppercorns and the interplay of gin, lemon juice and triple sec make this drink. Image courtesy Art of the Cocktail. Method: Combine the first six ingredients in a chilled shaker tin, then place six black peppercorns in a mortar and pestle and break them into a coarse grind. Place a pinch of this grind into the shaker tin, then dry shake. Next, add ice and hard shake, then single strain into a chilled old fashioned glass. 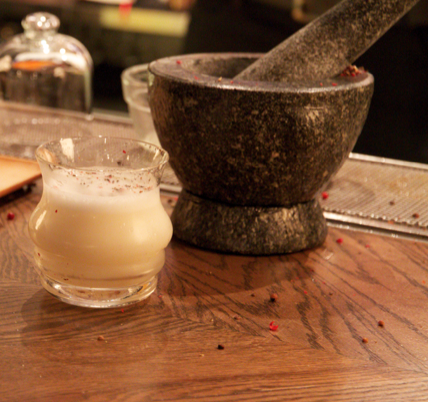 Muddle pink peppercorns and black peppercorns in the mortar and pestle, then use a pinch of the combined mixture to garnish. This entry was posted in Cocktails and tagged Evan Watson bartender, Jimmy Nguyen bartender, Sidecar by Merlet, Sidecar by Merlet cocktail competition, sidecar cocktail, Stone Cold Jane Austen recipe. Bookmark the permalink.